The process of tooth whitening lightens the colour of a tooth. Tooth whitening can be achieved by either changing the intrinsic colour or by removing and controlling the formation of extrinsic stains. The chemical degradation of the chromogens within or on the tooth is termed as bleaching. Hydrogen peroxide (H2O2) is the active ingredient most commonly used in whitening products and is delivered as either hydrogen peroxide or carbamide peroxide. In essence, hydrogen peroxide is analogous to carbamide peroxide as it is ultimately released when the stable complex is in contact with water. This means that most tooth whitening is due to hydrogen peroxide. When it diffuses into the tooth, hydrogen peroxide acts as an oxidising agent that breaks down to produce unstable free radicals. In the spaces between the inorganic salts in tooth enamel, these unstable free radicals attach to organic pigmented molecules resulting in small, less heavily pigmented components. Reflecting less light, these smaller molecules create a "whitening effect". There are different products available on the market to remove stains. For whitening treatment to be successful, dental professionals should correctly diagnose the type, intensity and location of the tooth discolouration. Time exposure and the concentration of the bleaching compound, determines the tooth whitening endpoint. 3.1.3 Internal bleaching on non-vital teeth. The perception of tooth colour is multi-factorial. Reflection and absorption of light by the tooth can be influenced by a number of factors including specular transmission of light through the tooth; specular reflection at the surface; diffuse light reflection at the surface; absorption and scattering of light within the dental tissues; enamel mineral content; enamel thickness; dentine colour, the human observer, the fatigue of the eye, the type of incident light and the presence of extrinsic and intrinsic stains. Additionally, the perceived brightness of the tooth can change depending on the brightness and colour of the background. The combination of intrinsic colour and the presence of extrinsic stains on the tooth surface influence the colour and thus the overall appearance of teeth. The scattering of light and absorption within enamel and dentine determine the intrinsic colour of teeth and because enamel is relatively translucent, the dentinal properties can play a major role in determining the overall tooth colour. On the other hand, extrinsic stain and colour is the result of coloured regions that have formed within the acquired pellicle on the enamel surface and can be influenced by lifestyle behaviours or habits. For example, dietary intake of tannin-rich foods, poor toothbrushing technique, tobacco products and exposure to iron salts and chlorhexidine can affect the colour of a tooth. With increasing age, teeth tend to be darker in shade. This can be attributed to secondary dentin formation and thinning of enamel due to tooth wear which contributes to a significant decrease in lightness and increase in yellowness. Tooth shade is not influenced by gender or the colour of a person's skin. Tooth discolouration and staining is primarily due to two sources of stains; Intrinsic and extrinsic (see Figure 2). In essence, tooth whitening primarily targets those intrinsic stains in which cannot be removed through mechanics such as a debridement (clean) or prophylaxis, in the dental office. Below explains in depth the differences between the two sources of which contribute to such discolouration of the tooth surface. Figure 2. Examples of tooth staining. Extrinsic staining examples: A. Smoking; B. Wine stain; and C. Food stain. 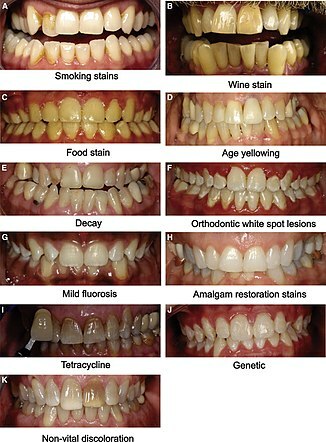 Intrinsic staining examples: D. Age yellowing; E. Decay; F. Orthodontic white spot lesion; G. Mild fluorosis; H. Amalgam restoration; I. Tetracycline stain; J. Genetic (amelogenesis imperfecta); K. and non-vital colouring. Extrinsic staining, is largely due to environmental factors including smoking, pigments in beverages and foods, antibiotics, and metals such as iron or copper. Coloured compounds from these sources are adsorbed into acquired dental pellicle or directly onto the surface of the tooth causing a stain to appear. Tannin in coffee, tea, and red wine can discolor teeth. Certain topical medications; Chlorhexidine (antiseptic mouthwash) binds to tannins, meaning that prolonged use in persons who consume coffee, tea or red wine is associated with extrinsic staining (i.e. removable staining) of teeth. Metallic compounds. Exposure to such metallic compounds may be in the form of medication or other environmental exposure. examples include iron (black stain), iodine (black), copper (green), nickel (green), cadmium (yellow-brown). Tetracycline and minocycline. Tetracycline is a broad spectrum antibiotic, and its derivative minocycline is common in the treatment of acne. The drug is able to chelate calcium ions and is incorporated into teeth, cartilage and bone. Ingestion during the years of tooth development causes yellow-green discoloration of dentine visible through the enamel which is fluorescent under ultraviolet light. Later, the tetracycline is oxidized and the staining becomes more brown and no longer fluoresces under UV light. Alkaptonuria: Metabolic disorder which promotes the accumulation of homogentisic acid in the body and may cause brown colour pigmentation in the teeth, gums and buccal mucosa. Prior to proceeding to tooth whitening alternatives, it is advised that the patient comes into the dental office to have a comprehensive oral examination that consists of a full medical, dental and social history. This will allow the clinician to see if there is any treatment that needs to be done such as restorations to remove caries, and to assess whether or not the patient will be a good candidate to have the whitening done. The clinician would then debride (clean) the tooth surface with an ultrasonic scaler, hand instruments and potentially a prophy paste to remove extrinsic stains as mentioned above. This will allow a clean surface for maximum benefits of which ever tooth whitening method the patient decides to go with. Before the treatment, the Oral health professional should examine the patient: taking a health and dental history (including allergies and sensitivities), observe hard and soft tissues, placement and conditions of restorations, and sometimes x-rays to determine the nature and depth of possible irregularities. The whitening shade guides are used to measure tooth colour. These shades determine the effectiveness of the whitening procedure, which may vary from two to seven shades. The effects of bleaching can last for several months, but may vary depending on the lifestyle of the patient. Consuming tooth staining foods or drinks that have a strong colour may compromise effectiveness of the treatment. These include food and drinks containing tanins such as; coffee/tea, red wines, curry etc. In-office bleaching procedures generally use a light-cured protective layer that is carefully painted on the gums and papilla (the tips of the gums between the teeth) to reduce the risk of chemical burns to the soft tissues. The bleaching agent is either carbamide peroxide, which breaks down in the mouth to form hydrogen peroxide, or hydrogen peroxide itself. The bleaching gel typically contains between 10% and 44% carbamide peroxide, which is roughly equivalent to a 3% to 16% hydrogen peroxide concentration. The legal percentage of hydrogen peroxide allowed to be given is 0.1-6%. Bleaching agents are only allowed to be given via dental practitioners, dental therapists and dental hygienists. Bleaching is least effective when the original tooth color is grayish and may require custom bleaching trays. Bleaching is most effective with yellow discolored teeth. If heavy staining or tetracycline damage is present on a patient's teeth, and whitening is ineffective (tetracycline staining may require prolonged bleaching, as it takes longer for the bleach to reach the dentine layer), there are other methods of masking the stain. Bonding, which also masks tooth stains, is when a thin coating of composite material is applied to the front of a person's teeth and then cured with a blue light. A veneer can also mask tooth discoloration. The advantages of this technique are that the results happen at one sitting at the dentist, it does not take a longer time for results to show like it does when the home bleaching technique is used. This is good if fast, effective results are required. However the disadvantages of this technique is that this is a one off treatment and if further whitening is needed the treatment will need to be carried out all over again. However, with at home bleaching, more bleaching gel can be purchased from the dentist and the same trays can be used, as long as they are intact and have no holes in them. Power or light-accelerated bleaching, uses light energy which is intended to accelerate the process of bleaching in a dental office. Different types of energy can be used in this procedure, with the most common being halogen, LED, or plasma arc. Use of light during bleaching increases the risk of tooth sensitivity and may not be any more effective than bleaching without light when high concentrations of hydrogen peroxide are used. Recent research has shown that the use of a light activator does not improve bleaching, has no measurable effect and most likely to increase the temperature of the associated tissues, resulting in damage. light accelerated bleaching now comes in ranges of intensities such as the phillips zoom light  which can aid in reducing post op sensitivity while maintaining effectiveness. The ideal source of energy should be high energy to excite the peroxide molecules without overheating the pulp of the tooth. Lights are typically within the blue light spectrum as this has been found to contain the most effective wavelengths for initiating the hydrogen peroxide reaction. A power bleaching treatment typically involves isolation of soft tissue with a resin-based, light-curable barrier, application of a professional dental-grade hydrogen peroxide whitening gel (25-38% hydrogen peroxide), and exposure to the light source for 6–15 minutes. Recent technical advances have minimized heat and ultraviolet emissions, allowing for a shorter patient preparation procedure. For any whitening treatments it is recommended that a comprehensive examination of the patient is done including the use of radiographs to aid in the diagnosis of the current condition of the mouth, including any allergies that may be present. The patient will need to have a healthy mouth and free of periodontal disease or caries and to have had a debridement/clean done to remove any tartar or plaque build up . It is recommended to avoid smoking, drinking red wine, eating or drinking any deeply coloured foods after this as the teeth may stain considerably straight after treatment. Internal bleaching on non-vital teeth. Internal staining of dentine can discolor the teeth from inside out. Internal bleaching can remedy this on root canal treated teeth. Internal bleaching procedures are performed on devitalized teeth that have undergone endodontic treatment (root canal treatment) but are discolored due to internal staining of the tooth structure by blood and other fluids that leaked in. Unlike external bleaching, which brightens teeth from the outside in, internal bleaching brightens teeth from the inside out. Bleaching the tooth internally involves drilling a hole to the pulp chamber no more than 2mm below the gingival margin, cleaning any infected or discoloured dentine, sealing, and filling the root canal with gutta-percha points, cleaning the inside of the canal using etchant and placing a peroxide gel or sodium perborate tetrahydrate into the pulp chamber so they can work directly inside the tooth on the dentine layer. In this variation of whitening the whitening agent is sealed within the tooth over a period of some days and replaced as needed, the so-called "walking bleach" technique.. A seal should be placed over the root filling material to minimise microleakage. There is a small risk of external resorption. An alternative to the walking bleach procedure is the inside-out bleach where the bleaching cavity is left open and the patient issued with a custom-formed tray to place and retain the agent, typically a carbamide peroxide gel inside the cavity. The patient changes the gel over 24 hours and uses a tray to retain it, they return to the dentist where this is sealed. On review once sufficient shade change has occurred the access cavity can be sealed, typically with a dental composite. At-home whitening methods include gels, chewing gums, rinses, toothpastes, paint-on films, and whitening strips. [needs update] Most over-the-counter methods utilize either carbamide peroxide or hydrogen peroxide. Although there is some evidence that such products will whiten the teeth compared to placebo, the majority of the published scientific studies were short term and are subject to a high risk of bias as the research was sponsored or conducted by the manufacturers. There is no long term evidence of the effectiveness or potential risks of such products. Any demonstrable difference in the short term efficiency of such products seems to be related to concentration of the active ingredient. Night guard vital bleaching is another increasingly popular method of dentist prescribed at home teeth whitening. These methods have gained popularity due to the fact that significant results can be achieved overnight without the removal of any tooth tissue making it a conservative method of lightening tooth shade.The process of night guard vital bleaching involves alginate impressions of the patients’ teeth in the first visit, this is then cast into stone and a custom-made vacuum form tray is made. The patient is provided with bleaching solution, which is placed into the tray for use overnight. The number of nights the tray is used would be dependent on the extent of staining and the shade desired by the patient. Due to the recent spike in the use of home teeth whitening products there is a lack of research regarding long term implications such as side effects and duration of results. Research has found that ‘nightguard vital bleaching is a safe, effective, and predictable method to lighten teeth. The whitening effect lasted up to 47 months in 82% of the patients, with no adverse side effects reported at the end of the study’. Whitening toothpastes are different to regular toothpastes in a way that they contain a higher content of abrasives and detergents to fight off tougher stains. Most contain low concentrations of carbamide/hydrogen peroxide (bleaching agents) – this lightens the colour of teeth. These whitening toothpastes make teeth one to two shades lighter. Toothpastes (dentifrices) which are advertised as "whitening" rarely contain carbamide peroxide, hydrogen peroxide or any other bleaching agent. Rather, they are abrasive (usually containing alumina, dicalcium phosphate dehydrate, calcium carbonate or silica), intended to remove surface stains from the tooth surface. Sometimes they contain enzymes purported to break down the biofilm on teeth. Unlike bleaches, whitening toothpaste does not alter the intrinsic color of teeth. Excessive or long term use of abrasive toothpastes will cause dental abrasion, thinning the enamel layer and slowly darkening the appearance of the tooth as the dentine layer becomes more noticeable. An alternative method of whitening at home, which competes with the use of a whitening paste, is the use of a patent whitening mouthwash. The mouthwash shows marginally better efforts at whitening compared to the use of paste. Whitening strips work by the placement of a layer of peroxide gel on the labial surfaces of teeth through the use of plastic strips that are shaped to fit there. Many different types of whitening strips are available on the market, after being introduced in the late 1980s. Each variety of whitening strips has its own set of instructions to suit the product, for example, different strips can be used at different frequencies to reach the same whitening end point. Whitening gels are also peroxide based, like the strips, and applied straight onto the tooth surfaces via the use of a small brush. Following manufacturer’s instructions they can lighten teeth by 1-2 shades. Another method used by people at home to whiten teeth is the use of whitening rinses - these contain oxygen sources, like hydrogen peroxide. To see a 1 -2 improvement in tooth shade could take up to 3 months. One purported method of naturally whitening the teeth is through the use of malic acid. [unreliable medical source? ][unreliable medical source?] The juice of apples, especially green apples, contains malic acid. On the other hand, excessive consumption of acidic beverages will slowly dissolve the enamel layer, making the underlying yellower dentine show through more noticeably, leading to darkening of the tooth's appearance. One study indicates that malic acid is a weak tooth whitening agent. Another purported method of naturally whitening the teeth is through the use of activated charcoal. Technically, activated charcoal doesn't "whiten" the user's teeth, it simply helps remove stains from the surface the teeth. Some dentists[who?] believe activated charcoal should not be used for teeth whitening whilst others[who?] believe there is rationale for using activated charcoal for teeth whitening as it may help absorb discolourations in the tooth enamel. Some groups are advised to carry out tooth whitening with caution as they may be at higher risk of adverse effects. Tooth decay. White-spot decalcification may be highlighted and become more noticeable directly following a whitening process, but with further applications the other parts of the teeth usually become more white and the spots less noticeable. Children under the age of 16. This is because the pulp chamber, or nerve of the tooth, is enlarged until this age. Tooth whitening under this condition could irritate the pulp or cause it to become sensitive. Younger people are also more susceptible to abusing bleaching. Persons with visible white fillings or crowns. Tooth whitening does not usually change the color of fillings and other restorative materials. It does not affect porcelain, other ceramics, or dental gold. However, it can slightly affect restorations made with composite materials, cements and dental amalgams. Tooth whitening will not restore color of fillings, porcelain, and other ceramics when they become stained by foods, drinks, and smoking, as these products are only effective on natural tooth structure. As such, a shade mismatch may be created as the natural tooth surfaces increase in whiteness and the restorations stay the same shade. Whitener does not work where bonding has been used and neither is it effective on tooth-color filling. Other options to deal with such cases are the porcelain veneers or dental bonding. The low pH of bleach opens up dentinal tubules and may result in dentine hypersensitivity, bringing about hypersensitive teeth. It manifests as increased sensitivity to stimuli such as hot, cold or sweet. 67 – 78% of the patients experience teeth sensitivity after in office bleaching with hydrogen peroxide in combination with heat. Sensitivity of teeth can persist up to 4 days after teeth bleaching cessation. However, it varies from person to person. 39 days of hypersensitivity has been reported post-bleaching. Recurrent treatments or use of desensitising toothpastes may alleviate discomfort, though there may be occurrences where the severity of pain discontinues further treatment. Potassium nitrate and sodium fluoride are used to reduce tooth sensitivity following bleaching. Hydrogen peroxide is an irritant and cytotoxic. At concentrations of 10% or higher, hydrogen peroxide is potentially corrosive to mucous membranes or skin and can cause a burning sensation and tissue damage. Chemical burns from gel bleaching (if a high-concentration oxidising agent contacts unprotected tissues, which may bleach or discolor mucous membranes). Tissue irritation most commonly results from an ill-fitting mouthpiece tray rather than the tooth-bleaching agent. Nearly half the initial change in color provided by an intensive in-office treatment (i.e., 1 hour treatment in a dentist's chair) may be lost in seven days. Rebound is experienced when a large proportion of the tooth whitening has come from tooth dehydration (also a significant factor in causing sensitivity). As the tooth rehydrates, tooth color "rebounds", back toward where it started. Overbleaching, known in the profession as "bleached effect", particularly with the intensive treatments (products that provide a large change in tooth colour over a very short treatment period, e.g., an hour). Too much bleaching will cause the teeth to appear very translucent. Home tooth bleaching treatments can have significant negative effects on tooth enamel. Study has been done and there is evidence that high concentration of carbamide peroxide can damage the enamel surface. Although the effect on enamel is less detrimental than seen after phosphoric acid etch, the increased roughness of the surface may make teeth more susceptible to extrinsic discolouration after bleaching. Intracoronal bleaching with 30% hydrogen peroxide decreases the micro-hardness of dentin. Thus, weakening the mechanical properties. Dental Amalgam – Exposure to carbamide peroxide solutions increase mercury release for one to two days. Resin Composite – bond strength between enamel and resin based fillings weakened. Glass Ionomer and other cements – Study suggesting that solubility of these materials may increase. Hydrogen peroxide might act as a tumour promoter. Intracoronal internal bleaching may also cause cervical root resorption, it is more commonly observed in teeth that are treated with thermo-catalytic bleaching method. Due to extensive removal of intracoronal dentin, tooth crown fracture can happen after intracoronal bleaching. The International Agency of Research on Cancer (IARC) has concluded that there is insufficient evidence for the carcinogeni-city of hydrogen peroxide. The chemical is now under Group 3: Unclassifiable as to carcinogenicity to humans. The genotoxic potential of hydrogen peroxide has been evaluated recently. Oral health products that contain or release hydrogen peroxide up to 3.6% H2O2 is not likely to increase cancer risk in individuals. Although treatment results can be rapid, stains can reappear within the first few months and years of treatment. In order to maintain the whitened appearance, there are ways to protect the teeth and prolong the treatment. There has been interest in white teeth since ancient times. Ancient Romans used urine and goat milk in an attempt to make and keep their teeth whiter. Guy de Chauliac suggested the following to whiten the teeth: "Clean the teeth gently with a mixture of honey and burnt salt to which some vinegar has been added." In 1877 oxalic acid was proposed for whitening, followed by calcium hypochlorite. Peroxide was first used for tooth whitening in 1884. Teeth whitening has become the most marketed and requested procedure in cosmetic dentistry. More than 100 million Americans whiten their teeth one way or another; spending an estimated $15 billion in 2010. The US Food and Drug Administration only approves gels that are under 6% hydrogen peroxide or 16% or less of carbamide peroxide. The Scientific Committee for Consumer Protection of the EU consider gels containing higher concentrations than these to be unsafe. According to a European Council regulation, only a qualified dental professional can legally provide tooth whitening products using 0.1 - 6% hydrogen peroxide, and that the patient must be at least 18 years old. Over recent years, there have been rising concerns over unlicensed staff providing poor quality tooth whitening treatment. Significant evidence has been gathered that tooth whitening procedures have been offered by beauty salons and health clinics under unskilled staff without dental qualifications. A group of recognised dental boards and organisations called The Tooth Whitening Information Group (TWIG) was established to promote safe and productive tooth whitening information and guidance for the benefit of the public. Reports can be made by the public to TWIG through their website regarding any individual providing illegal tooth whitening services, or if they personally undergone treatment done by an incompetent staff who is not a dental professional. In Brazil, all bleaching products are classed as cosmetics (Degree II) in legislature. There are concerns that this will result in increasing misuse of bleaching products and consequently there have been calls for reclassification. ^ a b c d e f g Carey, Clifton M. (June 2014). "Tooth Whitening: What We Now Know". The Journal of Evidence-based Dental Practice. 14 Suppl: 70–76. doi:10.1016/j.jebdp.2014.02.006. PMC 4058574. PMID 24929591. ^ a b c d Joiner, Andrew; Luo, Wen (2017). "Tooth colour and whiteness: A review". Journal of Dentistry. 67: S3–S10. doi:10.1016/j.jdent.2017.09.006. PMID 28928097. ^ a b c Kihn, Patricia W. (2007). "Vital Tooth Whitening". Dental Clinics of North America. 51 (2): 319–331. doi:10.1016/j.cden.2006.12.001. PMID 17532915. ^ a b c Joiner, A.; Hopkinson, I.; Deng, Y.; Westland, S. (2008). "A review of tooth colour and whiteness". Journal of Dentistry. 36 Suppl 1: S2–7. PMID 18646363. ^ a b c Veeraganta, SumanthK; Savadi, RavindraC; Baroudi, Kusai; Nassani, MohammadZ (2015). "Differences in tooth shade value according to age, gender and skin color: A pilot study". Journal of Indian Prosthodontic Society. 15 (2): 138–141. doi:10.4103/0972-4052.155035. ISSN 0972-4052. PMC 4762302. PMID 26929500. ^ a b Bernie, Kristy Menage (2011). "Professional whitening" (PDF). Access. 25: 12–15. ^ Carey, Clifton (2019-03-14). "Tooth Whitening: What We Now Know". The Journal of Evidence-Based Dental Practice. 14: 70–76. doi:10.1016/j.jebdp.2014.02.006. PMC 4058574. PMID 24929591. ^ a b Felton, Simon (2013). Basic Guide to Oral Health Education and Promotion. Hoboken : Wiley. ^ Scully C (2013). Oral and maxillofacial medicine : the basis of diagnosis and treatment (3rd ed.). Edinburgh: Churchill Livingstone. pp. 39, 41. ISBN 9780702049484. ^ a b c d Chi AC, Damm DD, Neville BW, Allen CA, Bouquot J (11 June 2008). Oral and Maxillofacial Pathology. Elsevier Health Sciences. pp. 70–74. ISBN 978-1-4377-2197-3. ^ a b Watts, A; Addy, M (2001-03-24). "Tooth discolouration and staining: Tooth discolouration and staining: a review of the literature". British Dental Journal. 190 (6): 309–316. doi:10.1038/sj.bdj.4800959. ISSN 1476-5373. ^ Pratibha, K.; Seenappa, T.; Ranganath, K. (2007). "ALKAPTONURIC OCHRONOSIS : REPORT OF A CASE AND BRIEF REVIEW" (PDF). Indian Journal of Clinical Biochemistry. 22 (2): 158–161. doi:10.1007/BF02913337. PMC 3453790. PMID 23105706. ^ Delgado, E; Hernández-Cott, PL; Stewart, B; Collins, M; De Vizio, W (2007). "Tooth-whitening efficacy of custom tray-delivered 9% hydrogen peroxide and 20% carbamide peroxide during daytime use: A 14-day clinical trial". Puerto Rico Health Sciences Journal. 26 (4): 367–72. PMID 18246965. ^ He, LB; Shao, MY; Tan, K; Xu, X; Li, JY (August 2012). "The effects of light on bleaching and tooth sensitivity during in-office vital bleaching: a systematic review and meta-analysis". Journal of Dentistry. 40 (8): 644–53. doi:10.1016/j.jdent.2012.04.010. PMID 22525016. ^ Baroudi, Kusai; Hassan, Nadia Aly (2015). "The effect of light-activation sources on tooth bleaching". Nigerian Medical Journal. 55 (5): 363–8. doi:10.4103/0300-1652.140316. PMC 4178330. PMID 25298598. The in-office bleaching treatment of vital teeth did not show improvement with the use of light activator sources for the purpose of accelerating the process of the bleaching gel and achieving better results. ^ "UTCAT2638, Found CAT view, CRITICALLY APPRAISED TOPICs". ^ a b "Lodi Dentist Improves In-Office Whitening Treatment". Internet wire. ^ Grace Sun, Lasers and Light Amplification in Dentistry. Dental Clinics of North America, Vol. 44 No. 4, October 2000. ^ Bortolatto, J. F.; Pretel, H.; Floros, M. C.; Luizzi, A. C. C.; Dantas, A. a. R.; Fernandez, E.; Moncada, G.; Oliveira, O. B. de (2014-07-01). "Low Concentration H2O2/TiO_N in Office Bleaching A Randomized Clinical Trial". Journal of Dental Research. 93 (7 suppl): 66S–71S. doi:10.1177/0022034514537466. ISSN 0022-0345. PMC 4293723. PMID 24868014. ^ "Statement on the Safety and Effectiveness of Tooth Whitening Products". American Dental Association. Retrieved 2010-07-05. ^ a b c d e f Hasson, H; Ismail, AI; Neiva, G (18 October 2006). "Home-based chemically-induced whitening of teeth in adults". The Cochrane Database of Systematic Reviews (4): CD006202. doi:10.1002/14651858.CD006202. PMID 17054282. ^ Leonard, R. H.; Bentley, C.; Eagle, J. C.; Garland, G. E.; Knight, M. C.; Phillips, C. (2001). "Nightguard vital bleaching: a long-term study on efficacy, shade retention. side effects, and patients' perceptions". Journal of Esthetic and Restorative Dentistry: Official Publication of the American Academy of Esthetic Dentistry ... [et Al.] 13 (6): 357–369. doi:10.1111/j.1708-8240.2001.tb01021.x. ISSN 1496-4155. PMID 11778855. ^ a b c d e f g h Demarco, FF; Meireles, SS; Masotti, AS (2009). "Over-the-counter whitening agents: a concise review". Brazilian Oral Research. 23 Suppl 1: 64–70. doi:10.1590/s1806-83242009000500010. PMID 19838560. ^ "UTCAT2368, Found CAT view, CRITICALLY APPRAISED TOPICs". ^ a b c Carey, Clifton M. (June 2014). "Tooth Whitening: What We Now Know". The Journal of Evidence-based Dental Practice. 14 Suppl: 70–76. doi:10.1016/j.jebdp.2014.02.006. ISSN 1532-3382. PMC 4058574. PMID 24929591. ^ "How to Whiten Your Teeth Naturally". Retrieved 2012-02-12. ^ "Foods That Whiten Teeth Naturally". Retrieved 2012-02-12. ^ Kwon, SR; Meharry, M.; Oyoyo, U.; Li, Y. (2015). "Efficacy of Do-It-Yourself Whitening as Compared to Conventional Tooth Whitening Modalities: An In Vitro Study". Operative Dentistry. 40 (1): E21–E27. doi:10.2341/13-333-LR. PMID 25279797. ^ "Activated Charcoal Teeth Whitening FAQ's". PROCOAL. Retrieved 2019-01-15. ^ "Activated Charcoal Teeth Whitening: Advice from a Dentist". Dr Steven Lin. 2017-09-27. Retrieved 2019-01-15. ^ "Tooth Whitening Treatments". Retrieved 2010-07-05. ^ Ricketts, David. Advanced Operative Dentistry, A Practical Approach. Churchill Livingstone Elsevier. ^ Nathanson, D.; Parra, C. (July 1987). "Bleaching vital teeth: a review and clinical study". Compendium (Newtown, Pa.). 8 (7): 490–492, 494, 496–497. ISSN 0894-1009. PMID 3315205. ^ Cohen, S. C. (May 1979). "Human pulpal response to bleaching procedures on vital teeth". Journal of Endodontics. 5 (5): 134–138. doi:10.1016/S0099-2399(79)80033-3. ISSN 0099-2399. PMID 296253. ^ "Clinical Trial of Three 10% Carbamide Peroxide Bleaching Products". www.cda-adc.ca. Retrieved 2017-10-27. ^ a b Leonard, R. H.; Haywood, V. B.; Phillips, C. (August 1997). "Risk factors for developing tooth sensitivity and gingival irritation associated with nightguard vital bleaching". Quintessence International (Berlin, Germany: 1985). 28 (8): 527–534. ISSN 0033-6572. PMID 9477880. ^ Wang, Y; Gao, J; Jiang, T; Liang, S; Zhou, Y; Matis, BA (August 2015). "Evaluation of the efficacy of potassium nitrate and sodium fluoride as desensitising agents during tooth bleaching treatment-A systematic review and meta-analysis". Journal of Dentistry. 43 (8): 913–23. doi:10.1016/j.jdent.2015.03.015. PMID 25913140. ^ Li, Y (1996). "Biological properties of peroxide-containing tooth whiteners". Food and Chemical Toxicology. 34 (9): 887–904. doi:10.1016/s0278-6915(96)00044-0. PMID 8972882. ^ Kugel, G; Ferreira, S; Sharma, S; Barker, ML; Gerlach, RW (2009). "Clinical trial assessing light enhancement of in-office tooth whitening". Journal of Esthetic and Restorative Dentistry. 21 (5): 336–47. doi:10.1111/j.1708-8240.2009.00287.x. PMID 19796303. ^ Kugel, G; Ferreira, S (2005). "The art and science of tooth whitening". Journal of the Massachusetts Dental Society. 53 (4): 34–7. PMID 15828604. ^ Betke, H; Kahler, E; Reitz, A; Hartmann, G; Lennon, A; Attin, T (2006). "Influence of bleaching agents and desensitizing varnishes on the water content of dentin". Operative Dentistry. 31 (5): 536–42. doi:10.2341/05-89. PMID 17024940. ^ a b c d e f g h Freedman GA (15 December 2011). "Chapter 14: Bleaching". Contemporary Esthetic Dentistry. Elsevier Health Sciences. ISBN 978-0-323-08823-7. ^ Azer, SS; Machado, C; Sanchez, E; Rashid, R (2009). "Effect of home bleaching systems on enamel nanohardness and elastic modulus". Journal of Dentistry. 37 (3): 185–90. doi:10.1016/j.jdent.2008.11.005. PMID 19108942. ^ Haywood, Van & Houck, V.M. & Heymann, H.O.. (1991). Nightguard vital bleaching: Effects of various solutions on enamel surface texture and color. Quintessence Int. 22. 775-782. ^ Lewinstein, I.; Hirschfeld, Z.; Stabholz, A.; Rotstein, I. (February 1994). "Effect of hydrogen peroxide and sodium perborate on the microhardness of human enamel and dentin". Journal of Endodontics. 20 (2): 61–63. doi:10.1016/S0099-2399(06)81181-7. ISSN 0099-2399. PMID 8006565. ^ Rotstein I, Mor C, Arwaz JR (1997). "Changes in surface levels of mercury, silver, tin, and copper of dental amalgam treated with carbamide peroxide and hydrogen peroxide in vitro". Oral Surg Oral Med Oral Pathol Oral Radiol Endod 83:506–509. ^ Hummert TW, Osborne JW, Norling BK, Cardenas HL (1993). "Mercury in solution following exposure of various amalgams to carbamide peroxides". Am J Dent 6:305–309. ^ American Dental Association (November 2010) [September 2009]. "Tooth Whitening/Bleaching:Treatment Considerations for Dentists and Their Patients". ADA Council on Scientific Affairs. ^ Swift EJ Jr, Perdigão J (1998). "Effects of bleaching on teeth and restorations". Compend Contin Educ Dent 19:815–820. ^ a b c Dahl, J.E. ; Pallesen, U. (2016-12-01). "Tooth Bleaching—a Critical Review of the Biological Aspects". Critical Reviews in Oral Biology & Medicine. 14 (4): 292–304. doi:10.1177/154411130301400406. ^ "Teeth Whitening - Cost, Types, Results & Risks". DocShop. Retrieved 2015-10-27. ^ "Tips for Keeping Teeth White". WebMD. Retrieved 2015-10-27. ^ "Maintaining Your White Smile Article | Whitening Basics | Colgate® Oral Care Information Whitening & Bonding". www.colgate.com. Retrieved 2015-10-27. ^ "Top 10 teeth staining foods". ^ Krupp, Charla. (2008). How Not To Look Old. New York: Springboard Press, p.95. ^ Antoniadou M, Koniaris A, Margaritis V, Kakaboura A. Tooth whitening efficacy of self-directed whitening agents vs 10% carbamide peroxide:a randomized clinical study. J Dent Oral Craniofac Res 2015;1(2):31-35 (doi 10.15761/DOCR.1000107). ^ "Tooth Whitening". 8 Dec 2014. ^ "Public Attitudes to Tooth Whitening Regulations" (PDF).